Hello there! This is the third report on my work on Outreachy internship program. If you want to be fully updated on what I have done so far, I recommend you to read the first and second reports. Build better native user management features into JupyterHub. Password can be reset by user or admin. I always keep remembering me what tasks I’ve done so far and what I want to be done by the end of my internship. This always helps me when dealing with developing something. Improved the authenticate method, so it actually checks if the user trying to log in has already made a sign up. Until the last report, I didn’t have a proper cicle going. Any user that did a sign up, automatically could enter the system. On this cicle, I focused on creating a more complete flow. What I created until now is a full cicle that I will give you an idea on this topic. The main details of implementation will be on the next topic. Assume the system is working and there is a new user to access the system. First, the person must make a sign up. To do this, he/she can go to /signup and create a new user. So far the sign up is pretty simple: you must create a username and a password. The user, by default, won’t be able to access the system. The user is created in the system, but it is still unauthorized. To authorize and manage users, an admin must enter the /authorize area. This area shows users that are allowed to log in the system as green rows and unauthorized users as blank rows. The buttons on each row handles the authorization of each user. Once the admin authorizes the user, the user will be able to access the system by going to the home (/) page and logging in normally. 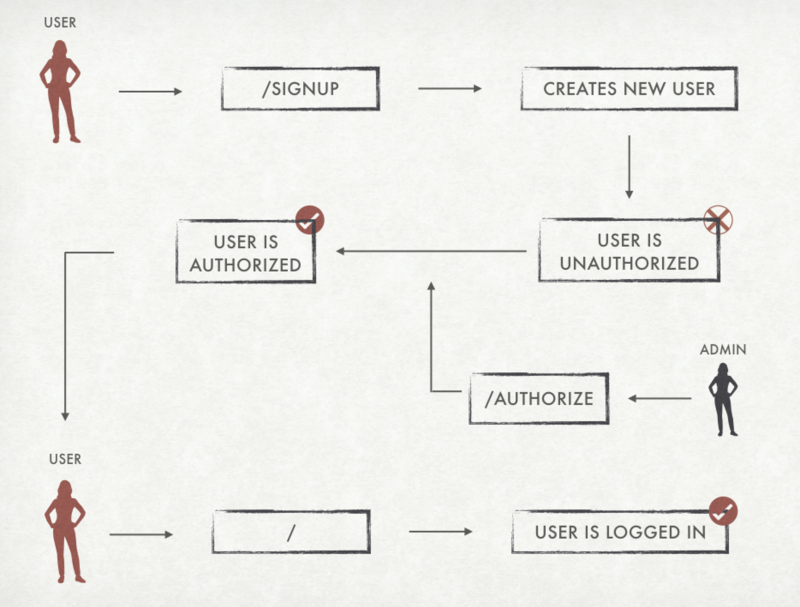 The first thing I did after I had the sign up cicle going on was to create the authorization flow I just showed you. First I had to create a new endpoint for the authorization area. This was made with a new handler called AuthorizationHandler that have a get method that would return an html template (autorization-area.html). After that I had to make the endpoint available only for admins, since we don’t want anyone with access to user management. JupyterHub already has a decorator @admin_only that does all the job for you. I had to put the decorator on the methods I wanted to be accessed only by admins. Then I needed the authorize area to show the list of users and their current status. To do this I had to pass to the template all users listed in my database (self.db.query(UserInfo).all()). Once I had all the users on my template, I used Jinja magics to create a new row in my table for every user in the list. It was also necessary to make all users unauthorized when created, because this should be the default pattern. On the ORM I created a new attribute called is_authorized that is always created with a False value. On the method of creating new users, I added a verification to see if the user created is listed as an admin, and set the is_authorized variable to True if it is. Then I added a verification on the authenticate method, to see if the user not only has a correct password, but if it has the is_authorized attribute set to True. And this was it: We had the whole flow described on the images 🙃. A thing that I really wanted was to give choices to our users. We wanted a lot of configurable features to help make Native Authenticator useful for a lot of people with different needs. During this period I worked on one option: password strength. check_password_strength would be a traitlet defined on the config file (config=True) that by default would be False. Then I added the check for uppers, lowers and numbers on my authenticate method. check_common_password: if this variable is set to True, when a user creates a new password, it will check this list of 10 thousand commonly used credentials to see if the password is common. If it is, it won’t allow the user to make the sign up. minimim_password_length: an integer that will block users to set passwords smaller than this size. For each scenario I added a test. This is good in terms of system but is a lot of tests really similar: I had to instantiate the authenticator, create a user and test the authenticate method with several setups. Then I used one of the amazing magics pytest has which is a fixture called parametrize. Then you can create tuples containing the values for each variable, for different scenarios. Such as the following which has a username name, a password 123, not authorized (False) and expected a False result.